Beautiful example of Nicholas Visscher's "Novi Belgii"
Engraving, 19 1/8”h x 129 1/8”w at neatline plus margins, uncolored. Folds flattened and a bit of scattered spotting, but very good or better. A remarkable map of the American West by Samuel Engel, reflecting one man’s interpretation and synthesis of more than half a century of discoveries, wishful thinking and outright invention. 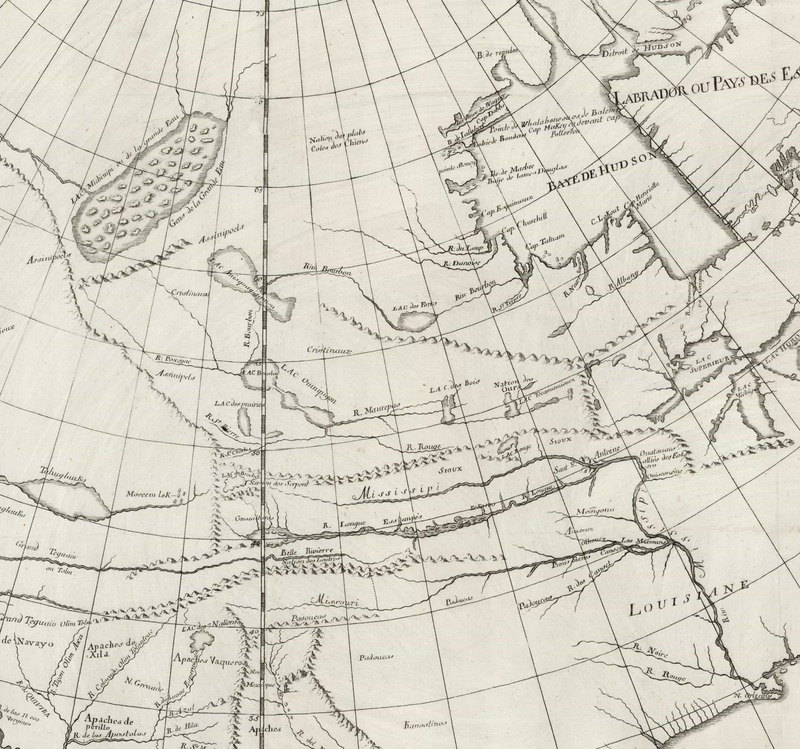 Engel’s map covers all of North America from the Gulf of Mexico to the Arctic Circle and from the Grand Banks to what appears to be a proto-Alaskan archipelago. 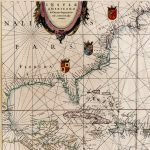 It is a remarkable piece of work, consolidating established conventions from earlier maps, cartographic speculations, and reports from voyages both dubious and factual into a fascinating interpretation of the general layout and waterways of North America. There is so much going on here that it would be impossible here to address everything of interest, so I will call attention to just a few of the map’s more salient features. The most striking of all is the complex of mountain ranges and rivers running east-west across the continent, including several mythical river systems extending inland from the Pacific and the Baron de Lahontan’s mysterious “River Longue” feeding the Mississippi. The eastern rivers almost but never quite meet their western counterparts, but their proximity raises the tantalizing possibility that such a passage may exist. The West is populated by a number of vast, largely fictitious lakes, though Lac Tahuglauks—also derived from Lahontan—could perhaps have a basis in indigenous accounts of the Great Salt Lake. The long mountain range running from the Pacific Northwest southeast to roughly present-day Colorado, yet another feature derived from Lahontan, bears a striking resemblance to the Rocky Mountains. 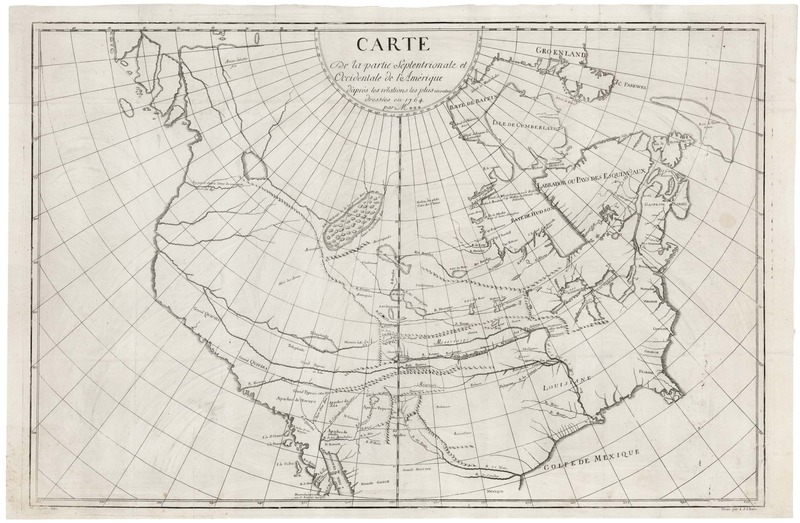 In the Northwest, roughly at the location of the Columbia River, flows a river bearing the label “Icy paroit etres le terme du voyage de Moncacht Ape.” Moncacht-Ape was a Yazoo Indian who, according to Le Page du Pratz, made the first recorded round-trip transcontinental journey, purportedly “scooping” Lewis and Clark by a century. Far to the north in the Arctic Engel locates “Anian d’autre fois” (roughly, “Anian at other times”), a reference to the 16th-century preoccupation with the Land of Anian at the far eastern reaches of Asia and the hypothetical Straits of Anian separating Asia from North America. To the west of Anian is a group of large islands, which Kershaw argues represent Engel’s reinterpretation of Vitus Bering’s discoveries in the Aleutian Islands or on the Alaskan peninsula itself. 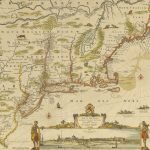 This map by Samuel Engel was the basis for the much better-known Carte des Parties Nord et Ouest de l’Amerique, one of ten maps prepared in 1772 by the firm of Vaugondy for a supplement to Diderot’s Encyclopedia. 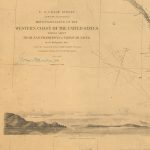 Though Wheat’s Trans-Mississippi West discusses the Vaugondy (vol. I #158), the Engel prototype is sufficiently rare as to go unremarked. 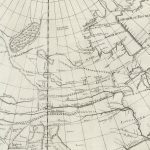 Kershaw, Early Printed Maps of Canada, vol. IV #1122. Not in Wheat, Trans-mississippi West. The book is mentioned in Howes, U.S.-Iana, #E149; Lada-Mocarski, Bibliography of Books Published on Alaska, #18; Sabin #22571; and Wagner, Northwest Coast, #603 & #604.